The reported decapitation of Haruna Yukawa is causing some to question the wisdom of Japan’s new security stance. On January 20, Islamic State released an online video in which it threatened to kill two Japanese citizens, Haruna Yukawa and Kenji Goto, unless the group received $200 million in ransom within 72 hours. On Saturday, a new video posted online claimed that one of the hostages, Yukawa, had been decapitated. The video appeared to show Goto holding a photo of the body of Yukawa. 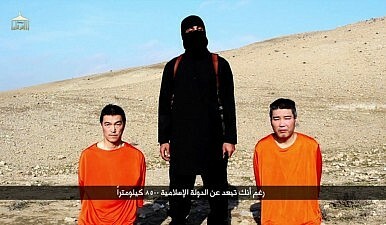 Yukawa is part of a growing list of foreigners beheaded by IS, including U.S. reporters James Foley and Steven Sotloff, British aid workers David Haines and Alan Henning, and U.S. aid worker Peter Kassig. In the video, a voice purportedly belonging to Goto conveyed a new demand from his IS captors. Instead of money, the group is now demanding the release of a female prisoner in Jordan, Sajida al-Rishawi, who has been sentenced to death for a series of 2005 terrorist attacks. Japan’s government said on Monday that it was seeking Jordan’s cooperation in securing Goto’s release, but would not confirm the content of those discussions. Even prior to the demand for al-Rishawi’s release, Japan was using Jordan as a base for the coordinating regional efforts to save the hostages. Confusion surrounded the initial release of the video on Saturday. According to SITE Intelligence, the video was posted to Twitter accounts linked to IS, but it was not released or confirmed by more official IS media sources. The U.S. and Japanese governments, after conducting their own investigations, concluded that the video was credible, but some of Goto’s family members and friends said they were not convinced the voice heard in the video was actually his. On Sunday, however, Islamic State’s Al-Bayan radio confirmed that the group had “carried out its threat” and executed Yukawa. Both the initial video and the radio broadcast blamed the Japanese government for Yukawa’s death, saying he was killed because Japan failed to pay the demanded ransom with the given 72-hour deadline. U.S. President Barack Obama joined Abe in condemning “the brutal murder” of Yukawa. “Our condolences today are with the people of Japan for their terrible loss… We stand shoulder to shoulder with our ally Japan and applaud its commitment to peace and development in a region far from its shores,” Obama said in a statement. That “commitment,” however, has come under some fire in Japan in the wake of the hostage crisis. On Sunday, around 100 people gathered outside the prime minister’s residence to demand that Abe do more to save the remaining hostage. Some of the protestors also blamed the hostage situation on Japan’s increased involvement in the fight against IS, including a financial aid package announced during Abe’s recent tour of the Middle East. How the domestic political fallout from the brutal murder of two Japanese nationals could upend Abe's foreign policy.